There’s a chill in the air and you’ve traded in the strappy sandals for boots and jumpers. Autumn’s arrival means a change in all kinds of style, hair included, and we’ve got the skinny on the fall hair colour trends you’ll be seeing all round the streets, the clubs and the ‘gram. We are thrilled to be sending our top stylists to Aveda Congress in Minneapolis, USA the first weekend in October! Aveda Congress is a global celebration honouring the craft of hairdressing. The best of the best in the Aveda network show off their creative chops in a series of artistic presentations. Learn more and follow our Aveda Congress team on Instagram! One of our favorite colour techniques at the mo is peekaboo colour: a pop of vibrant fashion colour subtly hidden beneath more conventional tones, poking out occasionally for a cheeky hello. Hold a buttoned-up position but want to show a hint of your wild side? Peekaboo hair colour is the perfect way to add a dash of flair to a conservative look, kind of like a funky pair of glasses. Not everyone can (or wants to) sport a full head of candy colours, but everyone can peekaboo! Your favorite morning bev provides the inspiration for this look, made up of deep, shiny browns painted with ribbons of caramel and blonde, like when you pour cream into your iced coffee and give it a swirl. Cold-brew hair is a more modern take on classically-highlighted cocoa or chestnut brunettes—the dimension is more pronounced with toffee highlights and espresso lowlights, melting down into a deliciously rich and creamy ombré finish. Okay, okay, we can hear you now: beige? BEIGE? Of all the colours in the world, you’re singing the praises of beige? Darlings! Would we steer you toward the mundane? This is not your boring 1980s- carpet beige. Beige-blonde hair is a neutral, ashy, almost sparkling blonde with a hint of gold that’s incredibly flattering and, dare we say, exciting. Its barely-there warmth keeps from washing you out without looking too yellow, and your colourist can customize it to work perfectly with any complexion. The shadow root is a perfect way to transition those summer highlights into cooler weather. Intentionally leaving the roots darker while artfully hand-painting the rest of the hair lets the style grow out without obvious lines of colour definition—so you can go longer between salon appointments. This lived-in look is as fashion-forward as they come right now, and its low-maintenance aspect is seriously appealing to our busy guests. The final effect is that you spent several months on a beach—and who doesn’t love to look like that? This upmarket twist on strawberry blonde is a warm, rich saffron tone we can’t get enough of. It falls somewhere in that decadent area between bright copper and burnished gold and has an expensive, jewel-like finish. Saffron just glows—this luxe colour is like walking around with a professional light kit on you at all times. It’s also beautifully customizable, so, as with any exclusive accessory, YOUR saffron is yours alone. What’s the point of getting the most Instagrammable hair colour you ever had if you’re going to let it fade away? Protect your investment with the proper hair products, all found in Aveda’s Color Conserve line. Whatever your colour dreams are for this fall, we have the team to make it happen, (and some will be freshly back from Congress and dying to tell you all about it). 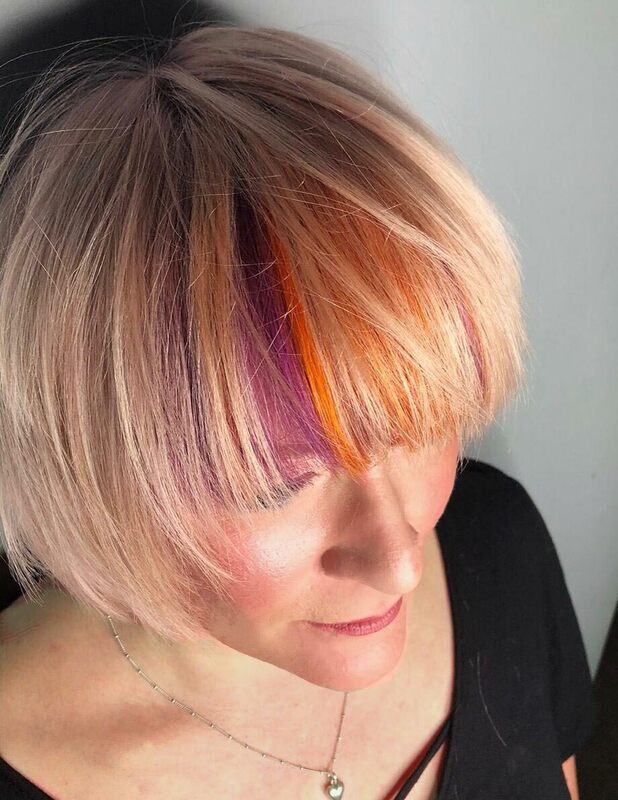 Book your fall hair update online, call us or stop by any of our salons: Fulham (020 7731 7633), Notting Hill (020 7229 6644), or Wimbledon (020 8090 5818) and talk to our colourists about what you want. Because as long as you’re pulling your favourite jackets out of storage, wouldn’t you love to top them off with stop-and-stare hair?